Archaeological sites, such as the City of David in East Jerusalem, above, reveal past civilizations throughout the Holy Land. Israel is made up of many layers. This includes levels of religious observance, diversity of cultures and quite literally, the layers of stones in buildings that reveal knowledge of past civilizations. This observation was most apparent in the first stop of the recent American Jewish Press Association press trip: Jerusalem. On Jan. 22, 23 participants — writers and editors from Jewish newspapers from across North America — gathered in the lobby of the Inbal Hotel Jerusalem to kick off a 10-day whirlwind tour of Israel. The AJPA trip was co-sponsored by El Al and the Israel Ministry of Tourism, the latter of which also hosted our first dinner in Israel, across the street from the hotel at the Olives & Fish restaurant. It is not possible to summarize the entire experience in a single article, but here is only a small sample of notes I took about the regions I visited: Jerusalem, northern Israel and Tel Aviv. If Central Avenue represented that border, it would be like having the streets to the east under Israeli control and the avenues to the west under Palestinian control. Our tour guide, Gideon Har-Hermon, grew up in Jerusalem and from the tour bus showed us his childhood home, which was on the Jordanian border at that time. He pointed out the bullet holes that remain in the walls of neighborhood buildings. A photographer was shooting photos of an African wedding party dressed in traditional garb. I asked a tour guide who was there with another group about the wedding party and he told me that they were African refugees, adding that many refugees sneak across the border to live in Israel and benefit from government programs. He said this with a hint of disdain in his voice, reminding me of the immigration issues we see in Phoenix. 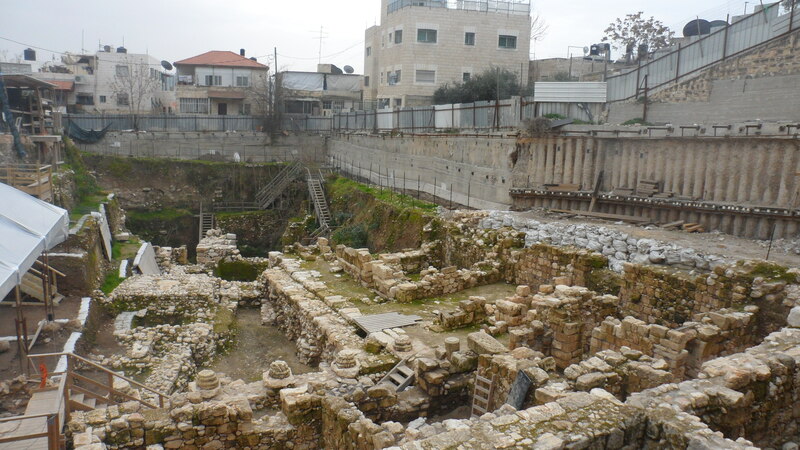 Earlier in the week during a tour of the City of David, which is in East Jerusalem, I overheard tour guides speaking in Hebrew, Chinese and Russian as our group walked through the archaeological site of what is believed to be King David’s palace. Walking through the Old City, I saw Orthodox Jewish men in streimels, Muslim women in hijabs and Christian women wearing nuns’ habits, as well as tourists in shorts and T-shirts. An impressive mix of old and new is the Tower of David Museum’s The Night Spectacular, a multimedia sound and light show that uses the stones of the walls and structures of the Citadel’s archaeological remains to tell the history of Jerusalem. 1. Parts of Israel are categorized in three zones: In Zone A, cities are completely in Palestinian control; in Zone B, the area is run by Palestinians but is under Israeli security; and in Zone C, land is completely under Israeli control. Route 90 does not go through Palestinian-controlled areas of the West Bank, but there are checkpoints along the way. At one, two IDF soldiers walked through the bus, then wished us a good visit. 2. Route 90, Israel’s longest road at about 298 miles, is close to the Jordanian border — just a few feet away at some points. Along the border, there is an electronic fence that alerts guards if it is touched. 3. If a Bedouin Arab man has multiple wives, he is required to provide each wife with her own tent when setting up their camp. The Bedouins in this area — whom you can see herding their sheep and goats on the side of the road — set up tents near the highway during the winter months because the highway provides access to transportation for jobs, but during the summer, they move through the desert. In other areas of Israel, the Bedouins are no longer nomadic and live in apartments. A side excursion to the north, dubbed a “food and wine tour” (our group split at this point, with some heading to Masada, the Dead Sea and down south to Eilat), is fodder for a whole other story that includes a stop in Safed; lunch at a Druze village; cheese-tasting at Makom BaLev, a homemade cheese shop; and a tour of Akko, the ancient Phoenician and Crusader seaport; as well as lots of food and wine. Our tour guide at the Golan Heights Winery explained the recent boost in the Israeli kosher wine market: The vast majority of Israeli wine making takes place in areas that were previously under Muslim control, and since Muslims don’t drink alcohol, these regions were not used for making wine. On a side note, the Golan Heights Winery was recently selected as a “New World Winery of the Year” by Wine Enthusiast magazine, the first time an Israeli winery has received this award. During this portion of our trip, we toured the Old City of Jaffa, which is believed to be the oldest port in the world. We also visited Independence Hall, where David Ben-Gurion declared the establishment of the State of Israel on May 14, 1948. It was particularly meaningful because the day before, we had visited Atlit, a restored illegal immigration detention camp from the time of the British Mandate, and there we learned of the Jewish immigrants who were released once Israel became a state. As we drove into Tel Aviv, our tour guide explained that the city uses the American definition for “old,” meaning buildings are 100 years old instead of thousands of years old, as they are elsewhere in Israel. There we stayed at the Dan Tel Aviv, which is very contemporary, down to the bedside panels that open and close the curtains. We also visited the new wing of the Tel Aviv Museum of Art. Certain things are true throughout the country, such as that Israelis are very hospitable and the food is delicious. We were fortunate to sample a variety of mouth-watering meals during our visit, including a 15-course meal at Eucalyptus, a gourmet restaurant in Jerusalem owned by Chef Moshe Bason that features unique dishes made from biblical ingredients. The Inbal offered an enormous breakfast buffet, as well as a Shabbat buffet that included a variety of fish, salads, soups, meat dishes and desserts. At Hotel Mizpe Hayamim in Rosh Pina in northern Israel, all the food served at the breakfast buffet and vegetarian restaurant, including cheeses, produce and baked goods, comes from its organic farm. Even a quick pita with falafel, tahini and salads in the Old City of Jerusalem was delicious. According to Stanley Morais, El Al’s deputy director of international affairs, whom I sat next to at an El Al-hosted dinner, one reason Israeli food is so tasty is that most of it is grown locally and served when it is in season. Another thing that was evident throughout the country is that Israeli businesses are very appreciative of American tourism. At many places we visited, owners thanked us for visiting and asked us to let our readers know about them. And it’s not just true with business owners — as we were touring the Old City of Jaffa, a group of Israeli teens passed us as we descended a steep flight of stairs. “Where are you from?” shouted one teen as she passed behind us. “America,” one of my colleagues answered. “Oh!” she exclaimed. This article originally appeared in the Feb. 8, 2013 issue of Jewish News of Greater Phoenix.